While Asia is home to many of its own restaurant chains, many American ones are also popular here. Some offerings are perfect copies of American versions, but many chains spice up the options based on their markets. This article is all about American fast foods and their Asian twists. During my travels, McDonald’s has been a staple: It’s inexpensive, it’s quick, you know roughly what to expect, and it can be healthy. In Hong Kong, for example, it’s tough to get a serving of vegetables, but for $3 USD, I can get a GCB (grilled chicken sandwich shaped like a McRib), a cup of corn, and a drink (usually a Coke Zero). Yes, McDonald’s offers corn here! The dessert scene is fun, too. Aside from the typical apple pie, Hong Kong’s menu included red bean pies for Chinese New Year and currently has a taro and corn pie, all of which are deep fried rather than baked. 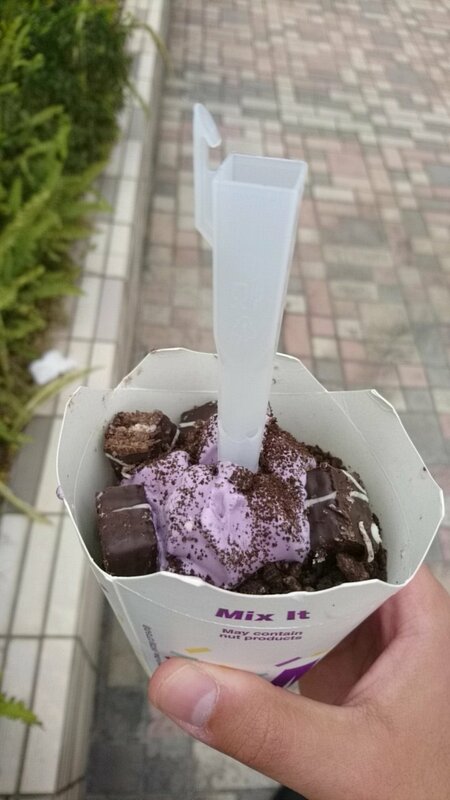 McFlurries here aren’t mixed by a machine; the toppings are simply placed atop the ice cream, and the current specialty is sweet potato ice cream and Oreo, an oddly delicious combination. Other unique items include a limited time ebi burger (seafood), fried chicken wings, a burger topped with a hardboiled egg, and seaweed and honey barbecue seasoning packets for fries. My personal favorite item, which I’ve mentioned before, is the Spicy Jalapeño Chicken Burger, which is crispy buttermilk chicken topped with grilled onions, lettuce, jalapeño tomato sauce, jalapeño slices, and a thick pineapple slice. It’s juicy, salty, sweet, spicy, and I love every bite. For breakfast, one Hong Kong platter features a Filet-O-Fish square. Sadly, there are no McGriddles. That’s an American exclusive. I’m told Singapore is one of the only markets where you can get curry sauce with your McNuggets. While the curry was good, I preferred the spicy sweet chili sauce (also available at Singaporean KFCs), which seemed to be a common alternative to ketchup. I also tried a veggie burger, and while I’m not sure what it was made of, it was fantastic. It didn’t try to taste like meat, but the flavor was still good, and the consistency was satisfying – not too soft, not too tough. 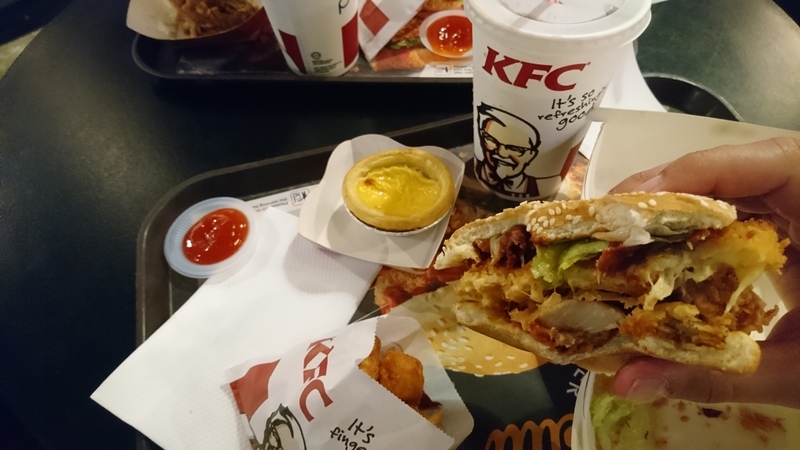 KFC isn’t particularly popular in America, but it’s one of the biggest fast food chains in Asia, and for good reason: The food is actually good here. Hong Kong’s menu includes a bucket filled with rice, then topped with American homestyle chicken and noodles. Another bucket is topped with fried chicken chunks and a mushroom-based sauce. The chicken legs, from what I can tell, are glazed with honey and served with waffle fries, so you really can’t compete with that. One of the chicken sandwiches is topped with a spicy sauce that reminds me of a Dairy Queen Flamethrower chicken sandwich, which was a nice blast to the past. The dessert menu contains egg tarts, a local favorite. As a nice touch, hands-on meals are served with a disposable plastic glove so you don’t get your hand sticky when you eat. In Singapore, I ate likely the most heart attack-inducing item I’ve ever gotten from a fast food restaurant: The Zinger Mozzarella Burger. It’s a thick fried chicken patty topped with bacon, pizza sauce, and a patty of fried mozzarella, then a piece of lettuce to make it look somewhat healthy. The sandwich ended up being so big, I could hardly bite the whole thing at once. Sure, the pizza-topped-with-chicken flavor was tasty, but it was so dense and filled with and untold numbers of calories. It sat like a rock in my stomach for the rest of the day. The tater tots it came with didn’t help matters. Aside from egg tarts, KFC in Singapore also has cheese tarts. I ordered the former, but I think I was given the latter, which I didn’t really enjoy. Of all the fast food menus I’ve encountered so far in Hong Kong, Pizza Hut’s is probably the most foreign. It’s a nonsensical smorgasbord of items with seemingly little to no regard for the fact that it’s a pizza chain, including waffles, fish and chips, ribs, pastas, soups, fried rice, and chicken wings, aside from pizzas. But hey, whatever strategy works. And it must, because despite what Americans would consider outrageous prices for pizza, the Hut is popular here. The most intriguing menu item, to me, is the Seafood Supreme pizza, topped with scallops, shrimp, pineapples, green pepper, red onion, olives, and thousand island sauce. It’s a combination I couldn’t make up if I tried, and I’m not touching it. I’m not a huge seafood fan, plus it’s roughly $20 USD for a pizza slightly smaller than a small in the USA. I swung by Popeyes while in Seoul, South Korea, and the small menu centered around fried chicken sandwiches. It had never before occurred to me that Popeye’s American menu doesn’t have chicken sandwiches for some reason, and it definitely needs to. Similar to the chicken sandwich at KFC, this one also had a spicy sauce. But no chain beats Popeye’s cajun seasoning, giving this one the edge. I also visited a Taco Bell in Seoul, and while I was glad to have any taste of my American guilty pleasure, I was a bit disappointed with the small menu and high prices. I did notice two unique menu items, though. The first is essentially loaded nachos, but with french fries instead of tortilla chips. The other is the Chocodilla, a simple, yet a great way to finish off the meal! In case you haven’t noticed yet, Seoul is full of American fast food. I saw a Burger King in Gangnam and stopped for lunch. I was pleasantly surprised with my burger: a beef patty and a chicken patty, topped with gooey queso-style cheese. Instead of fries, I got a side of coconut shrimp with sweet chili sauce, and my drink was a refreshing red berry juice with gelatin bits in it. Putting chewy substances in drinks is a theme around here. I didn’t pay attention to the rest of the menu, but a quick Google search shows that the menu also has burgers topped with seafood like shrimp or crab. I’ll pass on those. I was astonished to see a Krispy Kreme down the street from the Burger King, since the brand is a bit more niche. I ordered a regular black coffee, but I forgot that some coffee shops in Asia don’t have cream in the lobby alongside the sugar and stirrers, so I was only able to sweeten my drink. The roast wasn’t overpowering and was actually good without cream. Strawberries, being an imported treat, are all the rage in Asia this time of year. Restaurants seem to leverage them the way we do pumpkin during the fall. I had a red velvet donut topped with a creme cheese frosting and a fresh strawberry. Unfortunately, the donut itself was a bit stale since I stopped by in the afternoon, but the flavor was good. When Michael and I visited Singapore the following week, we also stopped at the Krispy Kreme near the Merlion on Sentosa, and I got a New York cheesecake donut. Since it was during breakfast hours, the donut was still soft and hit the spot. 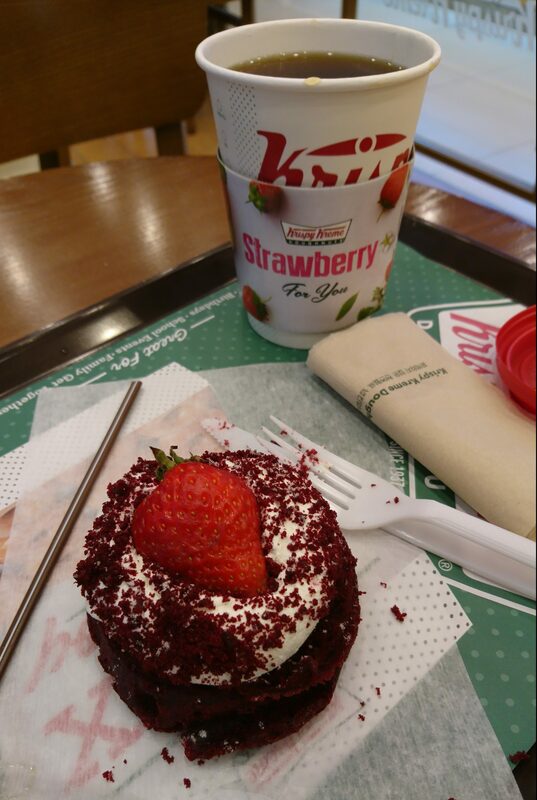 A Google search says that the cheesecake donut is available in America, but I think the strawberry red velvet one from Korea is a regional exclusive. Next week, I take off for Japan, meaning I’m sure I’ll have even more oddities to share soon!